The Slenderman. He lives deep in our collective subconscious, without our really knowing who he is or where he came from...or why he is the creepiest thing ever to haunt our laptops. But the truly scary thing about a collective mystery is that no one knows the truth. He’s pure mystery and menace. We’ll admit, that scares the bejeezus out of us. Hide the kiddos, because you are bound to be the single most bone-chilling, terrify guest at tonight’s Halloween party. We bet your buddy will rethink his decision to rent that abandoned warehouse when you arrive in this. 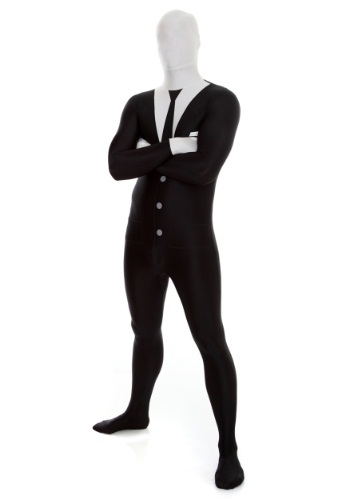 You don’t even need to spray paint your creepy symbol on the brick wall, everyone will know when you arrive in this Men’s Slenderman Morphsuit. A faceless man in a dark suit and tie? Yeah...thanks for the punch...we have a REALLY early day tomorrow and must get going now. Right now. Of course, you’re actually not here to cause any mischief--after all, the Slenderman’s mythology is varied, vague and ever changing. Maybe the haunting tale tonight is about how the Slenderman arrived at the party in this fully enclosed , faceless suit, did a few rounds, haunted the snacks for a while, then broke down and boogied ‘til daylight before skulking off into the morning. He said he was in search of a double cappuccino--but really, who really knows what he meant by that. (Shudder).